Born from the ashes of the popular Windjammer Barefoot Cruises line, Island Windjammers aims to pick up where that company left off by offering small-ship cruises that are focused more on the joys of sailing than on shipboard amenities. Passengers can even take a turn at the helm of one of the cruise line's three ships. When Windjammer Barefoot Cruises went bankrupt in 2007, several die-hard Windjammer fans decided to raise money to buy their own boat. In September 2009, the group bought Diamant from Federico "Fiddi" Angermeyer, a tour operator in the Galapagos, and the first cruise sailed from Grenada's Port Louis Marina on November 15, 2009. The line added another one of Angermeyer's ships, Sagitta, in 2012. In November 2014, the cruise line acquired Tole Mour and renamed it Vela; which has thus sailed since December 2015. 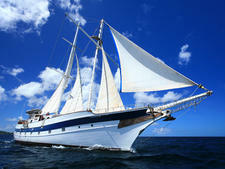 The 101-foot-long Diamant schooner is currently the only ship in the Island Windjammers fleet. A 12-passenger max allows for a social atmosphere and laid-back vibe. Island Windjammers' newest ship is a true sailing ship with three masts and billowing sails, offering a barefoot cruise that concentrates on sun and surf. For those who want to experience the Caribbean, Jimmy Buffet-style, it's hard to beat the "sun sand and sips" ambience of a Windjammer sailboat. 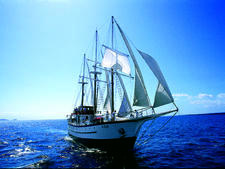 Island Windjammer's three sailing ships, Diamant, Sagitta and Vela, wholeheartedly embrace the concept of casual cruising. Swimsuits, cover-ups and T-shirts are typical daytime attire, and dressing for dinner usually means nothing more than putting on a clean shirt. The fleet's three vessels are intentionally short on typical cruise ship amenities, such as fitness centers, spas and theaters. But with their gleaming wood salons, teak decks and intimate outdoor dining areas, they are big on atmosphere. On a windjammer cruise, the upper deck is always a popular place to congregate, both when the waters are rough and for sunning when anchored. Diamant and Sagitta feature outdoor dining areas with cushioned benches, providing convivial alfresco dining, in addition to indoor dining rooms. Passengers can also use the space as an area to gossip, read and even nap. Vela, which begins sailing in December 2015, will have a spacious indoor dining saloon and an outdoor area for casual buffet meals on deck. The three ships have similar shipboard dining routines, serving up three squares and a hearty snack daily from their tiny galley kitchens. For those used to specialty restaurants and endless buffets, the one-option menus on a sailing cruise might seem simple. But food on all ships is fresh and well above average, incorporating island flavors. Standard double staterooms are compact yet cozy. All are air-conditioned, and even the smallest cabins have drawers and hooks for belongings. Sagitta and Vela feature Owners' Suites with en suite bathrooms. Diamant's Owners' Suite will debut in October 2016. Sagitta and Vela also cater to solo travelers offering two tiny, private Solo Sailor cabins on each ship. The two solo cabins share a bathroom. Cruise fares include all meals, snorkeling equipment, draft beer, wine and soft drinks. Come prepared to socialize; with so few passengers onboard, it's hard to be antisocial. Most cruises are a mix of solo travelers, friends traveling together and couples. While most passengers fall into the 40- to 60-year-old age range, there usually is a sprinkling of older and younger passengers. Discounted youth rates are offered in the summer. 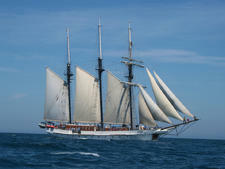 Diamant, a 101-foot-long schooner, is the first vessel acquired by Island Windjammers. Accommodating only 10 passengers at maximum capacity, Diamant offers a mix of charters and booked-by-the-cabin sailings. Diamant was scheduled for a renovation in the summer and fall of 2016, and thus joined the fleet back in October 2016. Built originally as a Swedish navy vessel, Sagitta is a 125-foot, three-masted motorsailer that accommodates 24 passengers. While crew members raise the sails, the vessel relies mostly on engines. Sails are used for auxiliary power. Vela, formerly Tole Mour, is a 155-foot three masted sailing schooner that Island Windjammers acquired in November 2014. Vela was converted from a sail training ship to a passenger vessel, which debuted back in December 2015. Vela accommodates 26 people.